Did you ever have a column of numeric data you wanted to simplify? For instance, numbers with 5 or 6 decimal places where only 1 is needed? 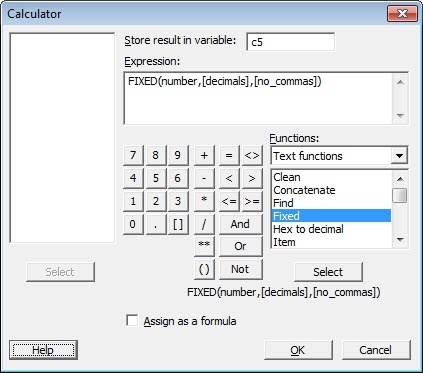 Here's a neat way to do it in Minitab Statistical Software, using the Calculator tool's FIXED function. This function rounds a number to the specified number of decimals and converts it to text, with or without commas. As you can see in the dialog box above, the function asks for three parameters: "number," "decimals," and an optional comma parameter. For "number," you enter the column of numerical data you want to convert. For "decimal," specify the number of decimals you want to keep. Minitab does the rest, including rounding your numbers to the nearest decimal. So, if "decimal" equals 1, Minitab rounds to the nearest tenth. If decimal = 0 Minitab rounds to the nearest integer. If decimal = -1, Minitab rounds to a multiple of ten. If you don't enter a decimal value, Minitab rounds to 2 decimal places by default. Minitab inserts commas to separate some place values (like hundreds and thousands, or hundred-thousands and millions) in the converted text. If you don't want the commas to appear, enter a value of 1 for the optional third argument, no_comma. If you want the commas to appear, enter 0 or exclude the third argument altogether. Quick and easy! And this is just one of the cool ways you can manipulate and adjust data using the Calculator.